The Belle Vue Hotel is in Olu Deniz, one of the prettiest areas in Turkey and, as a protected conservation area, will remain unspoilt. The village resort sits behind a curved strip of sand that embraces a natural blue lagoon. The Belle Vue Hotel is a charming place to stay and has delightful views across the village to the mountains and green forest that sweep down to the seashore. 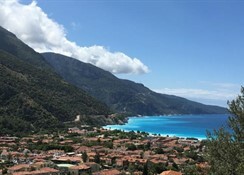 There is beautiful private beach in Ölüdeniz Lagoon where sunbeds and parasols are available free of charge and there is a complimentary shuttle bus twice a day from the hotel to Ölüdeniz and back. 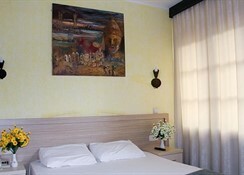 Getting to the hotel: 60 km from Dalaman Airport. Local Tips: This resort is well known for being one of Europes most famous handgliding centres. 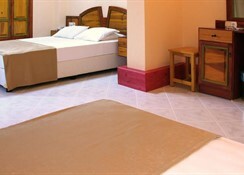 The hotel is just 12 km from the pretty town of Fethiye with its great choices of dining and entertainment venues. The facilities here at the Bell Vue are peaceful and relaxing - perfect for a laid back beach holiday. Food, drink and entertainment: There is an open buffet restaurant, pool bar, and evening shows twice a week. Sports, games and activities: Swimming pool with sun terraces, pool table and darts. 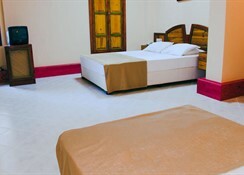 Additional: An elevator between floors and a reception service, laundry service, and house-keeping. 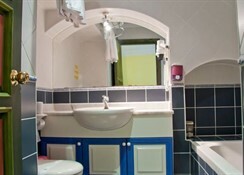 All the guest rooms are equipped with air-conditioning, satellite TV, music system, direct dial telephone, mini-fridge, hair dryer, en-suite bathroom with bathtub and shower, a safe box, balcony or terrace and many have a sea view.